I suggested more than a month ago that I had a few more stories to tell about the “family trip” that we made to Morocco in October. The last entry in the travelogue related our experience at Volubilus, the site of a Roman settlement that prospered primarily in the first couple of centuries of the first millennium A.D. After spending several hours inspecting the ruins of the city and learning some history, the rest of that day provided additional places, people, animals and scenery that made the entire day, though tiring, a remarkably diverse panorama of sights and events. Leaving the fertile and productive land surrounding Volubilus we stopped about 45 minutes later at the imperial city of Meknes. Located less than 100 kilometers from Fes, the city of Meknes is one of the four imperial cities of Morocco. Meknes served as the capital of the nation from 1672 until 1727 under one of the more famous sultans of Morocco, Moulay Ismail. He was known as one of the more brutal rulers, particularly for his persecution of Christians. During his reign, formidable defensive walls were built around the entire city, including several massive gates, the most famous one pictured above called Bab Mansour. Facing the gate is a vast plaza occupied most of the day and night, similar to the more famous Jma El Fna Square of Marrakech. There are always lots of people and activity there, both day and night. Presently the city has a population of approximately 640,000, making it the sixth largest city in the country. Knowing we had several other items on our agenda that day, we contented ourselves with viewing the other sites in Meknes from the car as we traveled toward the much smaller city of Azrou. Some of the most beautiful scenery in the Middle Atlas Mountains is located along the roads we traveled. Just a couple of examples of the aesthetic beauty we enjoyed are displayed below. 101st child to be placed in their care, an infant, joined one of the three homes maintained there. Workers who come there generally agree to an 18 year commitment, a remarkable example of service and dedication. I always leave with a profound sense of admiration and appreciation for their devotion, and often with a certain amount of regret that I have by comparison extended myself much too little for the benefit of others. Located just a few miles from The Haven, and deep within the heart of the Middle Atlas is a famous cedar forest. Over the past twenty years or so a tourist attraction has emerged that we now consider a must see for our guests. It is a colony of Barbary Apes that live in the forests. Though called apes, they are actually macaque monkeys. As they have become more acquainted with tourists and the peanuts and snacks they are offered, it appears that are becoming a bit more hostile in their behavior and sometimes not averse to grabbing food out of the hands of would be donors. There are already some groups lobbying to restrict tourists’ accessibility to the habitat of the monkeys. The park itself has become highly commercialized over the past few years with all sorts of other diversions offered for a price. The Cedre Gouraud is a very dead, but famous tree at the Cedre Gouraud Park where the monkeys are usually visible. Reputed to be the tallest cedar tree in the country when it died in 2003, it was estimated to be between 800 and 900 years old. Before darkness fell we hoped to make one more stop before starting the 75 kilometer trip back to Fes. Just 20 kilometers or so from the cedar forest is the city of Ifrane, a jewel in the Moroccan crown. The modern town of Ifrane was established by the French administration in 1928 during the protectorate era as a resort due to its Alpine climate. After gaining independence in 1956, gradually the property in Ifrane returned to the control of Moroccan citizens. It continued to flourish especially during periods of extreme temperatures, providing relief from the high temperatures of the tropical sun in late summer, and a winter playground for skiing and other sports in the winter. Ifrane has an elevation of 5.460 feet and it current population is about 75,000. 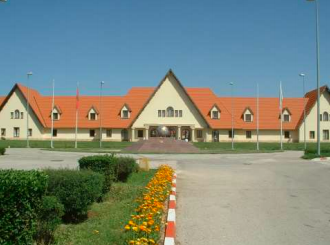 In 1996 the Al Akhawayn University opened in Ifrane satisfying a long-held dream of the previous king, Hassan II, to have a university in Morocco based on the American University of Beirut model. This is the university where I taught in 1997 – 98 and a couple of summer sessions since then. From an enrollment of 900 in 1997, there are now about 2,200 students obtaining an American style education. Except for language classes in French and Arabic, all instruction is in English. It is remarkable that the students are able to successfully complete courses utilizing the third language to which they have been exposed. The university now enjoys accreditation from one of the regional commissions in the U.S. and the programs in the College of Business as well as the Computer Science programs, both graduate and undergraduate, are fully accredited by their professional accreditations societies. I enjoyed very much my time teaching there and received a certain amount of social status when introduced as a professor at AUI (American University at Ifrane) as it is known colloquially. We failed to make it back to Fes before nightfall but felt that we had a very productive day. The day began at the site of a 2000 year old city and ended with a view of a modern American style university in North Africa that is less than twenty five years old. Ironic that the distance between those two entities can be covered in about ninety minutes. As usual, I experience a lot of pleasure and affirmation when sharing our knowledge and affection for the country that we first became acquainted with in 1971. Obviously the changes have been significant during the almost half century we have been engaged there. I especially enjoyed the opportunity of sharing so many good times with my family members. Tired by the day’s activity, we relished the anticipation of heading south toward the Sahara Desert the next day. I look forward to sharing those accounts with you as well, and certainly appreciate your comments to me from time to time.